At work, political attackers seem to some to be amoral, without conscience, or just plain slime. Doubtless, some are, but most are hard working people dedicated to purposes they consider worthwhile. What distinguishes them is that they see their attacks as justifiable, even necessary, parts of their workplace roles. 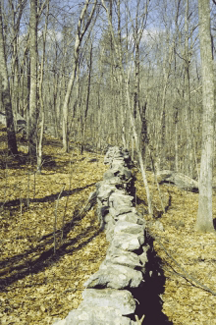 A New England stone wall, probably very like the one contemplated by the poet Robert Frost, in his poem, Mending Wall . It is this poem that contains the famous line, "Good fences make good neighbors." Both the poem and its most famous line deal with the paradox of fences — that the keeping apart that they do so well is what enables the neighbors to live together in (sometimes) harmonious community. Like fences, political attack is also a probably-essential, if paradoxical, part of organizational life. When we view it as vile, and try to expunge it, we also eliminate its benefits, among them, the mutual strengthening of the adversaries. Photo courtesy the Image Gallery of the American and New England Studies program of the University of Southern Maine. Some attacks are indeed vile and serve little purpose. Among these are attacks aimed at the target's essence or legitimacy. For organizational targets, they raise questions about their continued independent existence; for people, they emphasize the target's character. Enduring a political attack on one's essence is emotionally painful. It's unnerving, and some targets have difficulty maintaining the coolness needed for formulating effective responses. To learn how to reason under such pressure, it helps to appreciate the psychological advantages attackers enjoy. Although most of us are reluctant to initiate attack, we find it somewhat easier to respond to it. Initiation often creates feelings of guilt. Since the key to prevailing in a political conflict is capturing the initiative by counterattacking, targets probably cannot recover unless they can overcome their inhibitions. Since attackers have already dealt with their inhibitions, they can usually maintain dominance until the target's soul-searching is completed. Prepare in advance. If you anticipate attack, recognize that survival depends on your willingness to counterattack. Deal with your inhibitions by accepting that they apply only in times of relative peace. And remember that initiating attacks can be justified when your target's behavior is harmful to the organization. Most believe that political conflict has at least some rules. For instance, most agree that damaging a rival's computer is foul play. But at the margins, there's little agreement about what's fair or ethical. The advantage goes to the flexible. to respond to itown rules are your own. They're probably not shared by your attacker. Even though your attacker has been unwilling to engage in some kinds of conduct, those inhibitions might fall at any time. The more effective your response, the more likely is your attacker to overcome those inhibitions. Your political survival might require expanding your own boundaries more rapidly than your attacker does. Find ways to expand your boundaries with integrity. Diversions and distractions are methods for controlling the target. Diversions absorb the capacity of the target to counterattack. Distractions absorb the capacity of the target to understand the environment. Observe the political attackers in your organization. Notice their use of diversion and distraction. Determine their set routines; watch for improvisations. Anticipating what might be effective against you helps you design countermeasures. Learn techniques that help you when you attack. Would you like to see your comments posted here? rbrenziuDVrcCtXxIozzMner@ChacdSRxRHgLRkiYgcHgoCanyon.comSend me your comments by email, or by Web form. I offer email and telephone coaching at both corporate and individual rates. Contact Rick for details at rbrenlWCjlmopFVqHAFIUner@ChacJmToMktyHAnUVARmoCanyon.com or (650) 787-6475, or toll-free in the continental US at (866) 378-5470.